Hey everyone! Today I have an extremely cool project for you all! At Summer CHA 2012 I took the Tim Holtz Holiday Happenings class- it was so much fun! I learned so many new techniques and got to try out lots of new Tim products- I promise you, they won't disappoint! 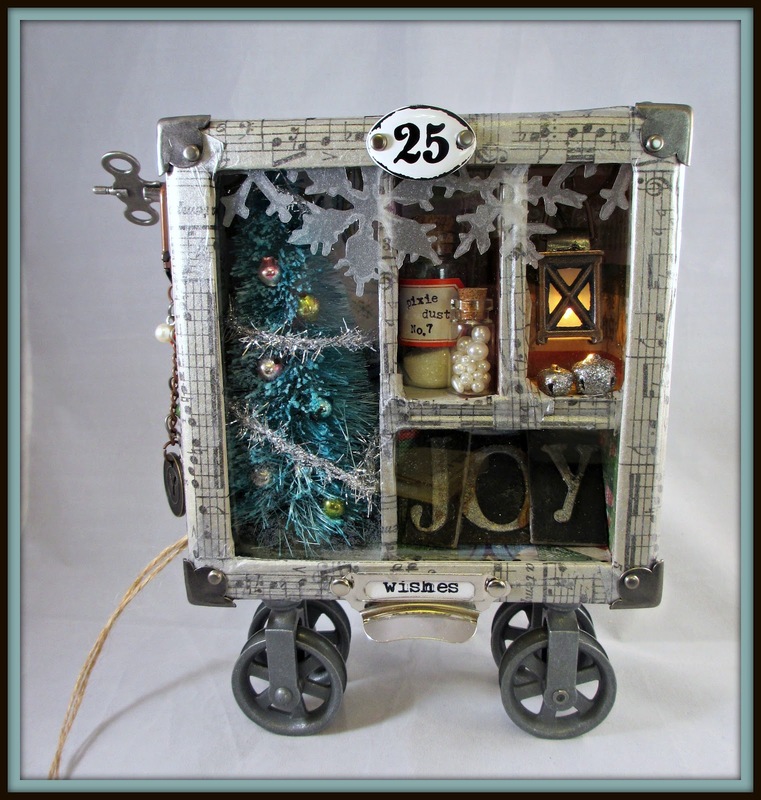 The class was so much fun- Tim Holtz is an amazing person! LOVE him. The shadow box is such a cool technique, and I love how we covered the edges of it in Tissue Tape to make it look sharp and add a little detail, and we went over it with the new Metallic Distress Stains. Gosh, I love those things! It makes it super shimmery! As you can see, the little lantern actually lights up, and, as you CAN'T see, the wheels actually move! Cool touch right? I love it! The tree is cool too, it was once white. Can you believe that? A few drops of Re-inker into a Mini Mister, and there you go! Squirt it on there, and its Broken China color! Then add some Glue and Seal, and some Rock Candy Dry Glitter- crafty Heaven! I also love the little bottle things. I love the Rock Candy dry glitter that I added in there, to make it look like true pixie dust- Christmas magic! The little jingle bells were hand glittered (is that what I wanna say?) by Tim and Mario- amazing guys! The film over the front has those beautiful snowflakes! LOVE! Everything about this project was absolutely amazing- the time and thought put into this is amazing.